Because we all live out of town, when my husband has appointments at the VA hospital in Asheville, and my dad and his wife have appointments with their doctors in Asheville, sometimes we meet for lunch. It was on one of these occasions that Dad introduced us to East Village Grille. As his local, Greek family owned favorites, such as Poseidon and Three Brothers, have faded from existence, lunch at East Village was a pleasant surprise. I’d love to see the interior updated a little, but the long benches and tables, reminiscent of so many Southern chain barbeque joints, allow for large parties while leaving plenty of elbow room for each guest. For parties including kids, even older ones like mine, that means less chance of a drink toppling or someone’s cold slaw dish getting shoved into another person’s place setting. The grille offers a gyro platter so bountiful that my husband, who frequents the hospital across the street for his ongoing treatment, had to share with everyone at the table. The burgers that our charming waitress planted on the table in front of my teen sons left all the occupants of our spacious booth with jaws hanging. Is it a coincidence that East Village was established a few yards from a medical facility? 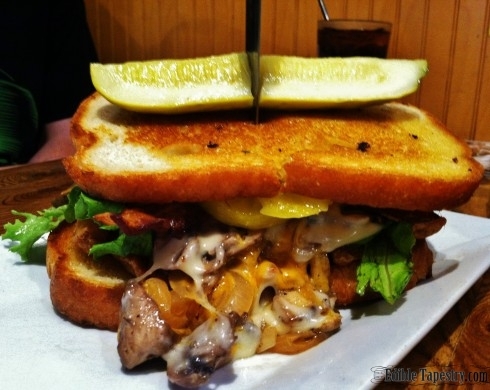 Hefty beef patties on thick slices of toasted bread– the melted cheese and toppings just puddle onto the plate. It’s a good thing that those medical appointments of my husband’s are few and far between these days, because knowing that these big, melty burgers are within reach with every visit is a serious temptation for this family. East Village Grille was established by the Papanastasiou Family over two decades ago at 1117 Tunnel Road in Asheville, NC. The restaurant is open 7 days a week. Monday-Thurs. 11 a.m. to 10 p.m.
Friday & Sat. 11 a.m. to 11 p.m.